Classical Net Review - Mozart - Violin Concertos, etc. 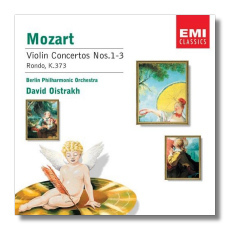 If you like your Mozart, big, warm, and uncomplicated, David Oistrakh (1908-1974) will meet your needs nicely. These recordings, made between 1970 and 1972, come from near the end of his life, but there was no diminution of his artistry at this late date. Playing from the podium – the old-fashioned way! - he seems wonderfully in control, and exhilarated by the music-making. And he should be, because we as listeners feel the same sort of exhilaration. Playing like this will seem old-fashioned to some, particularly to those who were weaned on "period instruments" recordings. Oistrakh's tone is full and warm throughout. He makes little attempt to play Mozart differently than how he would have played Beethoven, or Brahms, for that matter, but this is honest, eternally Classical playing, not to be swayed by trends and fads. Similarly, he uses vibrato liberally, in the modern manner. Cadenzas are Oistrakh's own (again, without excessive concern for musicological accuracy), or – in the cases of the Fourth and Fifth Concertos – by Ferdinand David and Joseph Joachim, respectively. In our more historically enlightened times, that would be a howler, but who cares? Similarly, as a conductor, Oistrakh doesn't over-interpret; he just says what needs to be said to support his violin, and then steps back. The plushness of the Berliners' playing his little to do with what Mozart would have known at the time. The tempos are slow, the interpretations a little sentimentalized, but no one who loves great violin playing should care very much. The inclusion of several small concertante pieces adds to the value of these discs; the presence of the K. 373 Rondo on both discs is a curiosity. Speaking of value, because these CDs are in the "Encore" series, they are budget-priced. At this cost, anyone can afford to own Oistrakh's Mozart as a first choice – and not a bad one, at that – or as a supplemental recording. The sound is still luscious. 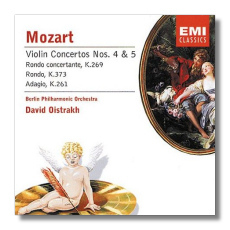 Having said that, although Oistrakh's Mozart concertos are wonderful, it's a competitive field out there, and it would be precipitous for me to claim that these particular recordings are essential to anyone's collection. I would go that far, however, for the third CD listed above; no one should deny himself its contents. The Mozart Sinfonia concertante was recorded in 1972, at about the same time as the solo concertos. Here, Oistrakh was joined by his son Igor, and he displayed his versatility by putting down his violin and taking up the viola. One would have to look very hard to find a more beguiling example of the viola's rich tone – Oistrakh makes it sound like a human voice, perhaps a contralto. With Igor Oistrakh, like father, like son: the violin playing is warm, unaffected, and as shapely and unexaggerated as a classical Greek statue. Put the two of them together, and you get a recording that grabs your ears, then your heart, and finally your brain. Among modern instruments recordings of this joyful work, Oistrakh and Oistrakh, while not especially idiomatic, reign supreme. Oistrakh recorded the Brahms Violin Concerto several times, but he never surpassed the recording preserved here. Set down in 1960, it matched the violinist with Otto Klemperer, one of the finest Brahms conductors of the era, and an orchestra that looks wrong on paper but that turns out to be very right in practice. 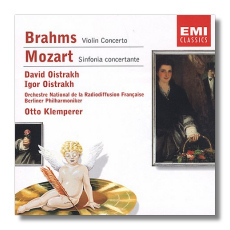 As mentioned above, Oistrakh's Brahms doesn't sound markedly different than his Mozart. His style is more appropriate for Brahms, however. Is there a recording that balances emotion with intellect better than this one? Is there a more eloquent Adagio or a more masculine finale? Serious but never forbidding, and tonally effulgent, this is a Brahms Violin Concerto for the ages. The engineering, despite its age, never lets us down for a moment. At this price, you can't afford not to get the last of these three CDs.